The Lawyers at Friedman, Domiano & Smith can help you achieve the best possible results if you or a loved one is a victim of a work injury. Years of experience and a team of expert attorneys help us to effectively handle even the most serious and complex cases. If you are injured on the job, don’t sign a release until you talk to a workplace injury attorney. Insurance companies can go to your house or your workplace and even on the side of the road. The release you sign may deny you compensation. If you are hurt on the job due to the fault of another employee, your employer, or purely by accident, you may have a workers’ compensation claim and you should contact our attorneys as soon as possible. Regardless of the obstacles you face – from workers’ compensation to construction accidents – we can help you achieve the best possible results. View our verdicts and settlements in personal injury cases. We collect no fees until you recover on your claim. We commit substantial resources to investigate your case, hire expert witnesses, and cover necessary expenses. If we win, we recover these expenditures. If not, you owe us nothing. Deciding If You Have a Case? We can help you determine if you have a case and give you the information you need to make a decision. Our entire legal team will help you regain your life by stepping in at this crucial time. We feel our success is based on our defined approach to each case, which includes a thorough investigation, a full review of legal documents and ongoing consultations. Copyright ©2019 Friedman, Domiano & Smith Co., L.P.A. All Rights Reserved. This site and its content may not be copied in part or full without express written permission. 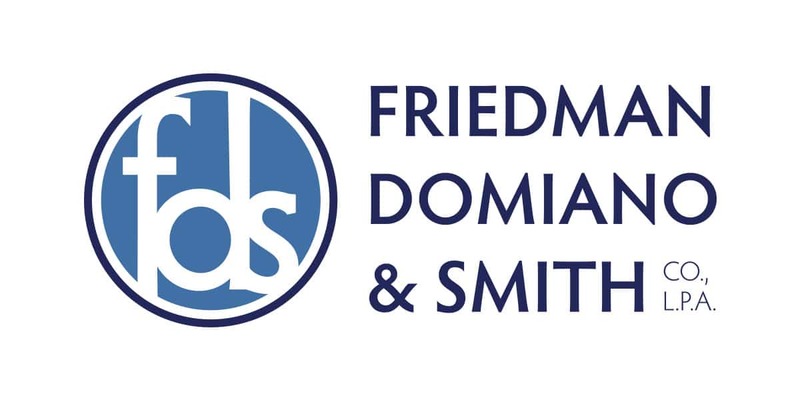 Friedman, Domiano & Smith Co., L.P.A. has a rating of 5/5 based on 7 testimonials.